Some kitchen accessories are unnecessary—especially when you can do the job with other tools just as easily—while others are essential. 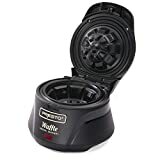 If you enjoy having waffles for breakfast, a waffle maker is one of those essential tools; there is simply no way to make waffles without one. 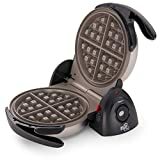 If you look around online, you’ll be able to find plenty of other uses for waffle makers (home cooks can be very creative). But when shopping for a waffle maker, you really just need to ask two questions: can it make good waffles, and can it make plenty of them? This guide will aid you in your quest to find a waffle maker that answers “yes” to both questions. 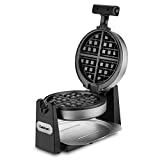 Plug-In: This is the most popular type of waffle maker—it plugs into the electric socket, and has heating elements on both the top and the bottom. When the maker is heated, simply add the waffle batter and close; the weight of the top and bottom will force the batter into an even layer for quick, even cooking. Flip: Flip waffle makers rely on gravity to guarantee even cooking. Halfway through cooking, the maker is rotated, allowing batter to drip down and coat the other pan, allowing for even cooking. 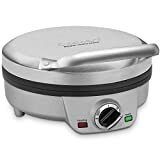 Multiple: Most makers are designed to cook one waffle at a time, although makers that cook two waffles at a time can be a real time-saver for people who need to cook for a crowd. 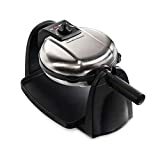 Stovetop: Decidedly old-fashioned, stovetop waffle makers are heated directly on the stove, then loaded up with batter and turned by hand for even cooking. Even cooking: One of the easiest ways to mess up a waffle is to have it come out uneven, with one side browned perfectly and the other either overdone or undercooked. Great waffle makers provide even, consistent heating to create perfectly-cooked waffles. No-stick surface: Even though users generally help things along with a few spritzes of cooking spray, sticking can be an issue for some models, leading to torn waffles and burned bits (once they can be scraped off). Better models don’t have this problem, completely releasing waffles as soon as they’re done cooking. Weight: This is a balancing act. A maker that is too heavy can be burdensome to use, while one that is too light often doesn’t have enough mass to evenly distribute heat. The best models are light enough to use, but heavy enough to provide fast, even cooking. Easy cleanup: Really good makers come with deep grooves and runoff areas to catch excess batter, so that they don’t make a mess of the kitchen. Controls: Look for a waffle maker with simple, easy-to-use controls. Some of the best ones on the market simply have an easy temperature control, an on-off switch, and lights to tell you when the maker is hot enough to add the batter. 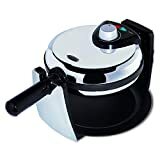 Adjustable heat: You’ll want to purchase a maker that has several temperature settings, which will allow you to meet your diners’ tastes by making crispier or softer waffles. Material: Waffle makers come in a variety of materials. In general, metal makers are a bit heavier and provide more even cooking, but even amongst metal makers, you have options, including steel and heavy-duty aluminum. Shapes: Round waffles are the traditional shape, but today it’s possible to find makers that produce a variety of waffle shapes, including squares and even hearts. All-Clad: All-Clad is an American manufacturer of cooking equipment. Established in 1967, the company is perhaps best known for its excellent line of pots and pans, but it also produces a wide range of other cooking utensils. Oster: Oster is an American home goods manufacturing company that was founded in 1924. Although they make products for many different home uses, Oster is best-known for its kitchen wares, including mixers, blenders, and other appliances. Hamilton Beach: Hamilton Beach is an American company that has been producing blenders, cookers, and other kitchen devices since its founding in 1910. KitchenAid: KitchenAid is an American manufacturer of cooking appliances. Founded in 1919, the company is best known for its iconic mixers, although they produce a wide range of devices to fit virtually all culinary needs. Black & Decker: Black & Decker is an American manufacturer. Founded in 1910, the company is best known for its power tools, but its home appliances division produces an array of high-quality gadgets.